Remember those magnetic IKEA canisters from years ago? Well, aside from the sugar dispenser, I haven’t come up with a really good use for the other two. Even this idea isn’t a ‘good’ use. Six of them will fit inside one canister (if you smush down the edges of the bottom three) and a trimmed book of matches fits on the side. But to what end? This would be a terrible emergency car kit because for certain I’d forget about it and in summer it would be a can of melted wax and pieces of string to small to use. It’s magnetic, so I guess it could live on the fridge for a…… romantic lighting emergency? Oh, well. It’s enough that it made a post for today. If you used the canister with the hole drilled in it and put the candles in your car in summer, you’d have melted wax for those emergencies when you had to seal a parchment with a signet ring. Well, it certainly looks cute! 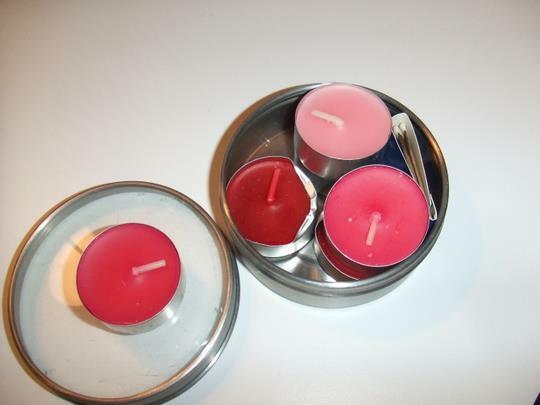 Maybe you could melt the wax into the container itself, put in a new wick, & have one big candle. And then…..um….no, go with the emergency romantic lighting kit. Light those candles for Peggy’s birthday. I always like it when I’m mentioned in a post. It makes me feel popular. Susana uses them for paper clips, binder clips and other little desk thingies. She has a little metal strip stuck to the wall where she puts the magnetic boxes.